Extra large version of our Black Jet throwers, these knives are constructed from one piece of solid tempered 420 stainless steel with jet-black finish. Each knife has perfectly balanced blade-to-handle weighting. Includes a custom fitted sheath with liner. 5 1/2 in. blade, 10 1/2 in. overall. Relatively heavy, smooth, and easy to throw. My only complaint is that the tips are very thin and bend easily after one bad throw, I have already had to rework all of them. Other than that they are well made knives and the sheath is good except the fit is extremely tight. ok knife. little heavy and hard to throw sometimes. the rope came loose, i cut it off. its not that good for the price. These knives are absolutely second to none. I ordered these knives and used them like there was no tomorrow and they still maintained there form and shine. I recently lost them(worst thing i have ever done) and i am in the process of ordering them again because of their AWESOMENESS. 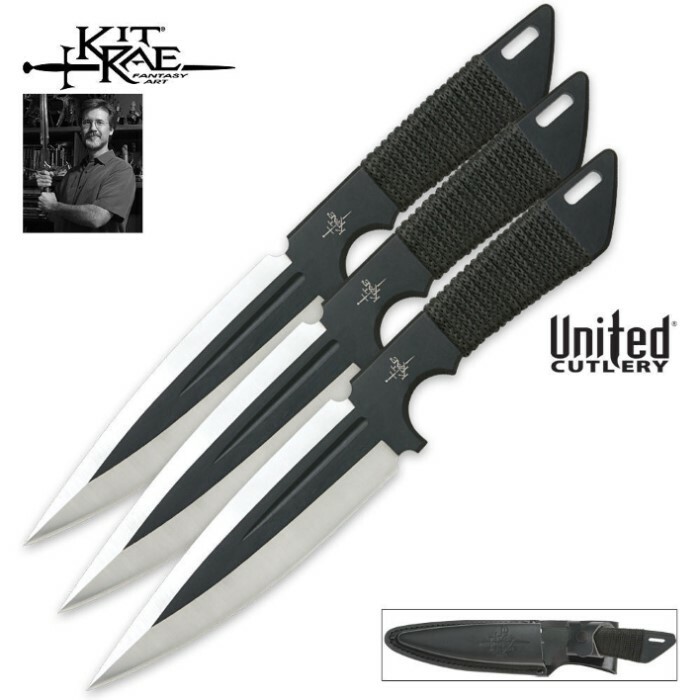 These knives look wicked and are very solid. The stock edge leaves something to be desired and they are too costly and large for me to have thrown one yet, but they feel very good in your hand and the sheath is of good quality too. Definitely a handle-thrown blade. They are also well-balanced right in between the finger grip and blade. pretty nice knives. they look a little delicate but there not, and they feel good to throw. the cord on the handle of one of them came off from throwing so i ripped it off of the other two also for consistency. worth the money. Seems well balanced but must admit I have not thrown it yet. Sturdy, not bendy. Nice razor edge which is easy to improve. Disappointed that the top edge is flat faux edge. Do not know if it is possible to put a razor edge on this top faux. Would prefer double razor edges. Handle is comfortable and wellwrapped nothing to catch on. Sheath is nice thick leather with just one compartment for all three knives instead of three separate compartments. Does not seem to injure the knives, though.